Hi there! Looks like I’m not alone on this one, but none of the other threads are giving me any info to help. 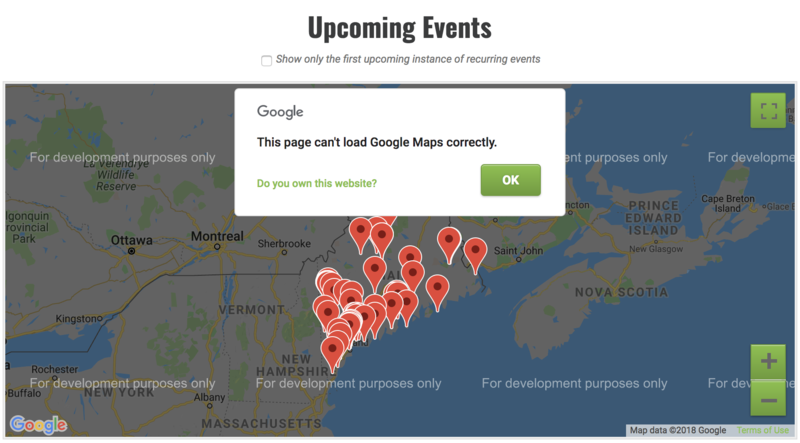 With the new Google Map updates (including their paid service levels) we lost all Google Map functionality within Event Calendar. We managed to get a new API key from Google (it wasn’t easy…they seem to force everyone to set up a billing account, which we finally found a way to bypass, as our traffic is well within the limits for the free service). Upon adding that key to our Event Calendar settings, however, the map still does not work at all. Any help would be greatly appreciated. Sorry to hear that you are having issues with Google Maps, you indeed are not alone — these API changes have been frustrating for many. Upon taking a look at the browser console, it’s looking like the API key isn’t properly configured. Thanks so much! Unfortunately, that article is out of date. The process for obtaining an API key is now completely different and seems to force us into setting up a billing account, which we prefer not to do (we are way below their limits for the paid subscription levels now being offered). This is where we’re stuck, however…I did manage to bypass the billing setup, got an API key, and plugged it into the calendar settings where indicated. Even with the new API key, the map is not working. We could really use some advice on this one…thanks in advance! Sorry about that! I’ll flag it so we can get that fixed. I also want to apologize about the delayed reply, I’ve been out for a bit. Yep, I’ve spent over an hour trying to follow their instructions, to no avail. As I said, it’s nearly impossible to get around their requirement to set up a paid account. We did somehow work around it, got an API key, and confirmed that java was enabled. Still…zero map functionality. Actually, maybe we don’t have Java working properly. Now I’m not actually sure. Impossible for me to get to any place where this is controlled. We are perpetually stopped at this screen no matter what we do. Our site is WELL below the traffic requirements to use maps for free. We do not want to set up a billing account, and can’t seem to get any add’l info for our API without having to sign up for one. Yeah, unfortunately Google is trying to get everyone to set up billing. I was able to get a test site set up using an existing API credential. Here’s what I did. As long as you have an existing project, it should take you to the project, if not click on the project name. There should be a check green check that says API enabled. If it’s not enabled, click manage and from there, you should be able to enable. WOW! Thank you so much…we were never even able to find or get to these pages and options, so this was a huge help! Our Java script API was not enabled, but we’ve now confirmed that it is (green check is there). With that, the map is still not functioning properly, and we’re getting “This page can’t load Google Maps correctly” (see attached screenshot). For good measure, I’ve also double checked to be sure we’ve got the correct API Key plugged into our Event Calendar settings. The map looks like it wants to load, with active pins appearing, but then the error message pops up. There must be something easy/minor we’ve missed in this process? So sorry for leaving you hanging for so long Mary! It looks like Google is going to keep trying to force you to set up billing. In the Developer Console (in Chrome you can right click on a page and click inspect) it’s saying that you exceeded your limit. No problem on timing, and thanks for helping to dig deeper on this! I have a hard time believing that we are exceeding traffic limits, however. We had a total of 6,820 unique page views site-wide during the month of September, which is one of our peak months. Of those visits, only 1,383 were to our events page where the map lives. For good measure, I even ran data for all of 2018 (Jan 1 thru Oct 3) and we had 34,775 total page views, with 5,809 of them being our event/map page. From the info I’m able to find, the first/free tier for Google maps allows for 0-100,000 page views monthly (or annually? even if annually, we are still well below the number)…or am I mis-informed? Any advice on how I should proceed? GA data reference for September (above) is attached. Regrettably, I’m not sure how much more we can do or how much more guidance we can provide. The above advice from Google suggests an API key or billing issue needs to be resolved and I think the next logical step if you feel you are within free limits is, as a Google Maps customer, to reach out to the Google Maps team themselves. I wish we could do more but, while we make it possible to integrate with Google Maps, billing and account issues in relation to that platform are somewhat out of our purview. As a sidenote, we’ve been a little slow to respond to you recently. Part of this is because we’re experiencing a lot of demand for support, but it’s also a result of us transitioning to a new support platform. My apologies for any frustration this has caused. The topic ‘Google Map No Longer Working’ is closed to new replies.